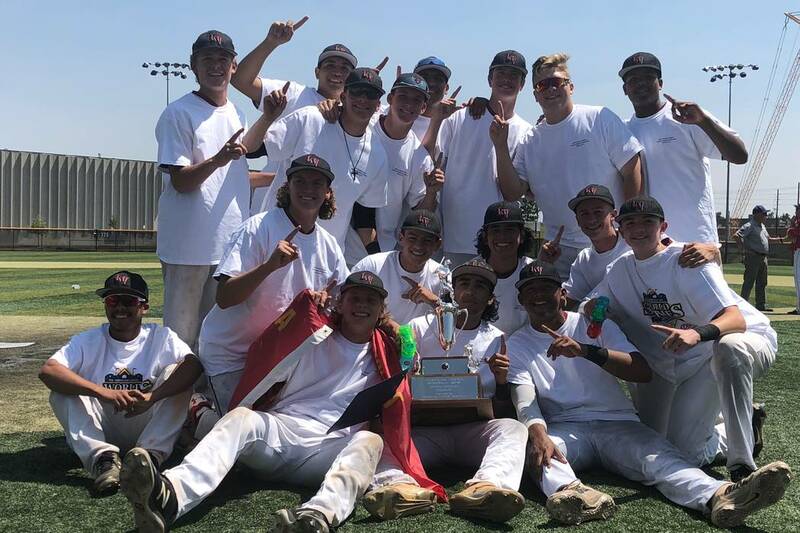 The Desert Oasis Aces scored five times in the first on the way to an 11-1 rout of League City (Texas) in the championship game of the American Legion Western Regional on Sunday in Denver. From the moment Jason Sharman led off the bottom of the first inning with a triple, it was clear what sort of day it was going to be for the Desert Oasis Aces. The Nevada champion Aces scored five times in the first on the way to an 11-1 rout of League City (Texas) in the championship game of the American Legion Western Regional on Sunday in Denver. Desert Oasis advances to the American Legion World Series for the first time. It will open against Meridian (Idaho) at 4:30 p.m. Thursday in Shelby, North Carolina. “We’ve been working towards this all summer, so to achieve the team goal, obviously we’ve got one more to get and that’s our next goal, but to get two of the three done feels good,” coach Paul Buboltz said. Sharman doubled twice and scored three times. Parker Schmidt, Chaison Miklich, Aaron Roberts, Zac Czerniawksi and Colby Smith all doubled, and Izzy Gutierrez knocked in three runs. By the end of the second inning, Desert Oasis led 9-1. Josh Sharman fired a four-hitter, allowing a run in the first before settling down and giving up only one hit the rest of the way. The combination of strong hitting and strong pitching has been a staple for the Aces in the postseason. In the state and regional tournaments, Desert Oasis outscored its opponents 102-24. The regional alone was even more one-sided, as Desert Oasis held a 41-6 advantage. The win also gives the Aces a chance to match what their rival did last year. Desert Oasis and Basic have met in the state championship game each of the last three years. Basic won last year and went on to win the World Series. This is the first time since 2010-11 that Nevada will send a team to the World Series in back-to-back years. Basic and Bishop Gorman, in 2008, are the only teams to have won. “Having Basic go last year, then us this year, it’s all Las Vegas baseball together,” Buboltz said. More preps: Follow online at nevadapreps.com and @NevadaPreps on Twitter. Game 1 — Wilmington (Del.) vs. Dubuque County (Iowa), 7 a.m.
Game 2 — Gonzales (La.) vs. Braintree (Mass. ), 10 a.m.
Game 3 — Randolph County (N.C.) vs. Midland (Mich.), 1 p.m.
Game 4 — Meridian (Idaho) vs. Desert Oasis, 4 p.m.
Game 5 — Wilmington (Del.) vs. Gonzales (La. ), 1 p.m.
Game 6 — Dubuque County (Iowa) vs. Braintree (Mass. ), 4 p.m.
Game 7 — Midland (Mich.) vs. Desert Oasis, 10 a.m.
Game 8 — Meridian (Idaho) vs. Randolph County (N.C.), 1 p.m.
Game 9 — Gonzales (La.) vs. Dubuque County (Iowa), 4:30 p.m.
Game 10 — Braintree (Mass.) vs. Wilmington (Del. ), 10 a.m.
Game 11 — Midland (Mich.) vs. Meridian (Idaho), 1 p.m.
Game 12 — Desert Oasis vs. Randolph County (N.C.), 4:30 p.m.
Game 13 — Winner Stars vs. Runner-up Stripes, 1 p.m.
Game 14 — Winner Stripes vs. Runner-up Stars, 4 p.m.